While I was doing row A I had a quick look at row B and it looked like the row from hell. As it turned out block B01 is an easy one. 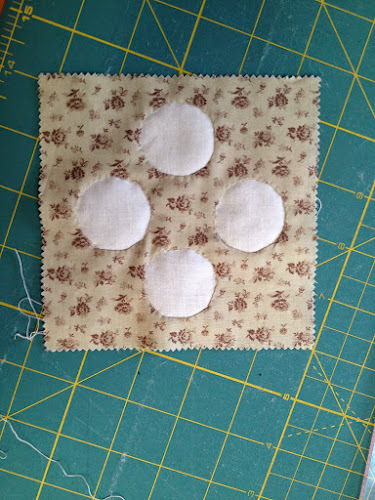 My applique circles aren’t perfectly round but I was expecting that. 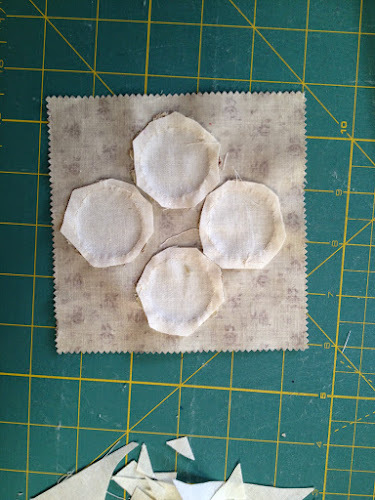 I used reverse appliqué with freezer paper on top and a charm square for the background. 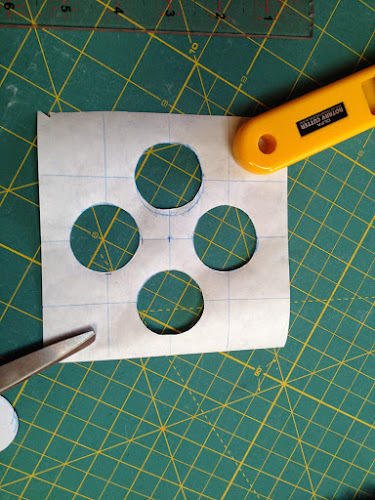 I cut out one of Susan Gatewood’s circles from her free pattern to use as a template to draw the circles. 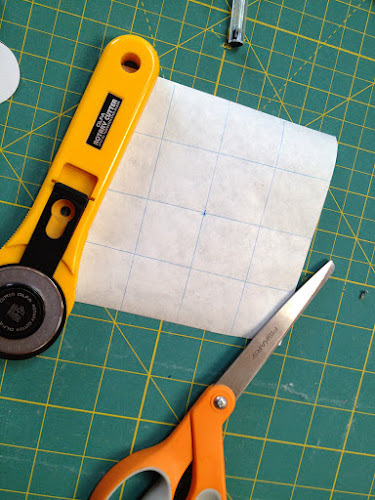 I cut a 4 1/2 in square of freezer paper. 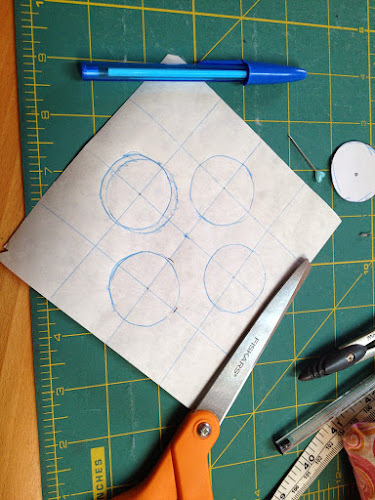 To work out the placement of the circles I drew a grid like below. I drew a line at 1 1/4 intervals on each direction. 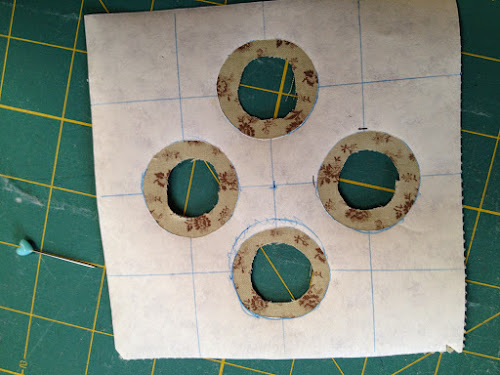 Then I put a needle through the centre of the circle and through one of the axis in the freezer paper. I drew all the circles this way. 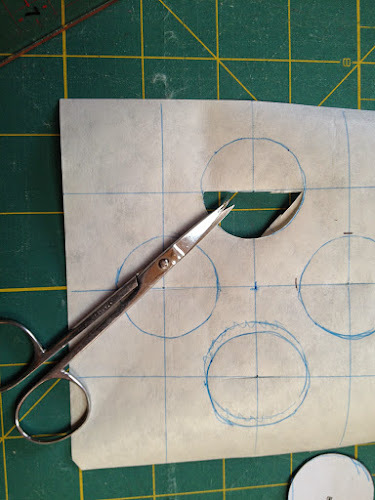 Then I cut them out using a very small pair of scissors. This is important if you’re a bit scissor challenged like me. So here is my charm square. 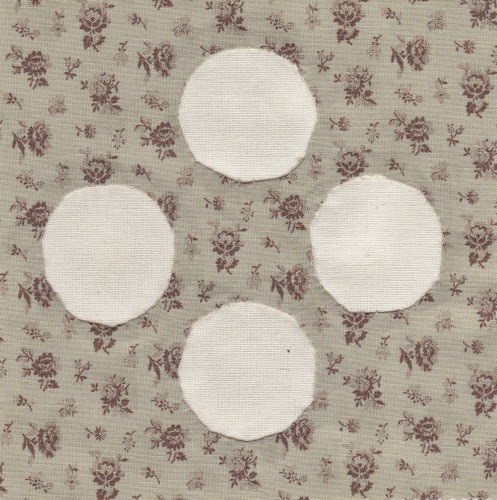 And the fabric for the circle. I pressed the frezzer paper on top of the charm square. 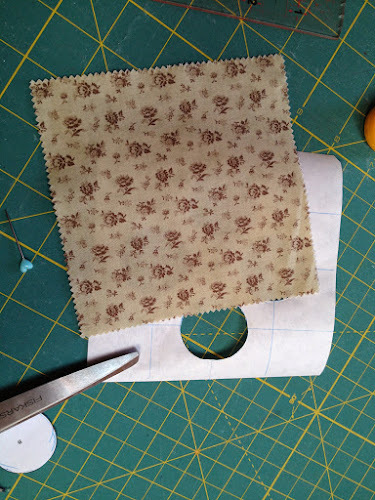 I cut the fabric around leaving a 1/4 seam allowance. A bit smaller would have been easier to turn over. 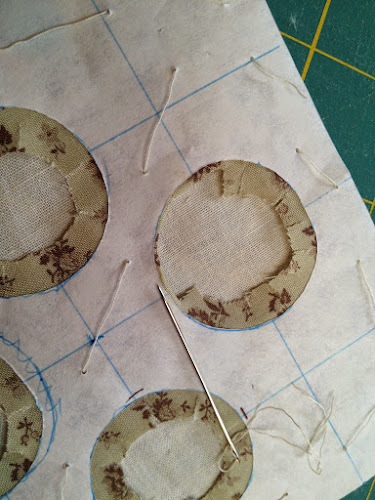 And also I made some small cuts all the way to the freezer paper. 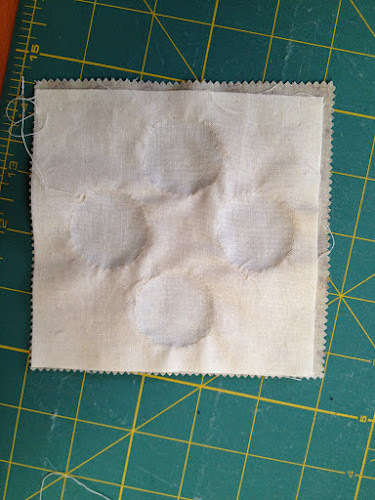 Then I placed the white fabric underneath. I basted the three layers so they wouldn’t move. Remove the basting and freezer paper. 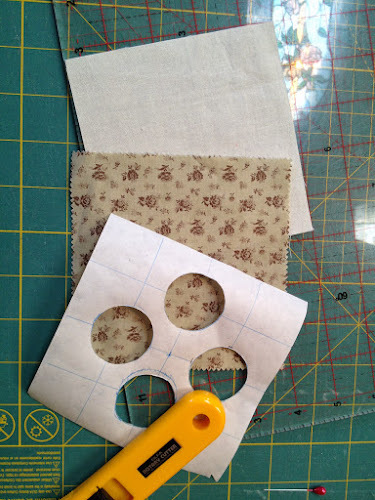 Trim off excess fabric and that’s it. That looks great! Thanks for the step-by-step. By the way, how can I get a virtual quilt like you have? Thanks! Hi Elizabeth, I’m not using a virtual quilt as such. 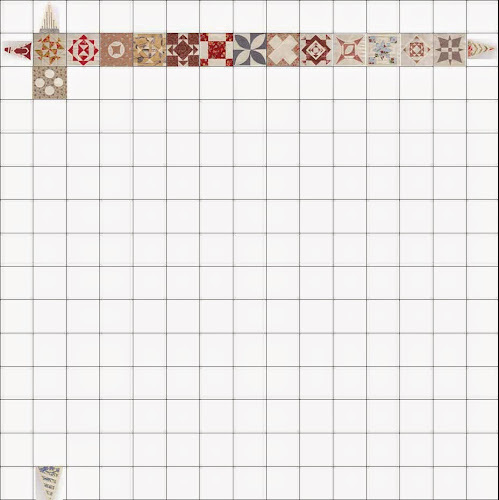 I made a grid and I’m adding the blocks with photoshop. 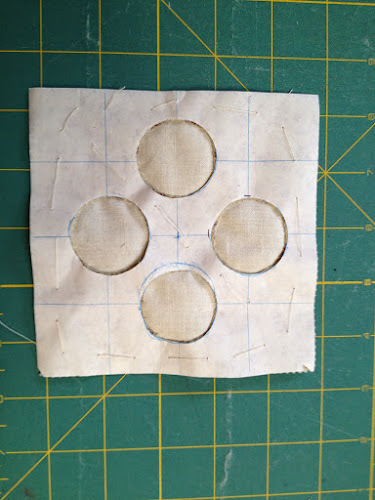 I can post the grid to facebook if you like.